The idiom “going astray in a complex situation” originates from an ancient Chinese story about the search for a lost sheep. The central figure in the story is Yangzi, a famous philosopher and scholar who lived in the state of Wei during the Warring States Period (475–221 B.C.). One day, Yangzi’s neighbor lost a sheep and mobilized his whole family as well as many others in the community to help look for the animal. 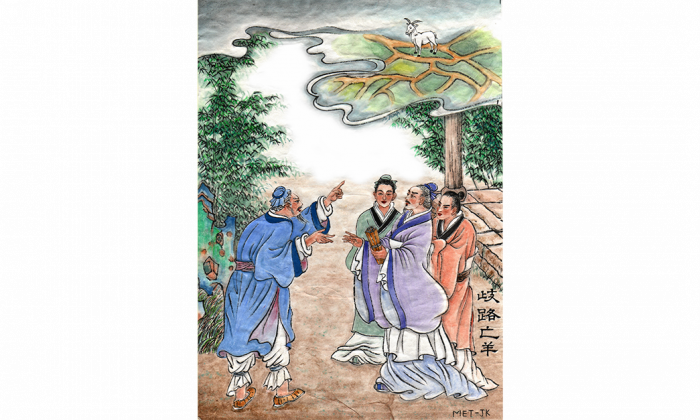 He came to Yangzi for help, and Yangzi sent all of his students and servants out to help look for the sheep. Together with the neighbor’s relatives and friends, Yangzi noticed that a very large group of people had been gathered to join in the search. “Why are so many people required to look for one lost sheep?” Yangzi asked the neighbor. “Because there are many forked roads,” the neighbor answered. The others agreed that this was the same reason they came back. Yangzi became thoughtful and silent for a long time, looking very serious and leaving his students puzzled and not understanding what their teacher was thinking about. Then, after having deeply pondered the situation, he taught the following principle to his students: “When there are too many side roads diverging from the main route, you are unable to find a lost sheep and could easily lose the way yourself. “Similarly, when a student has too many interests diverging from his main goal, he can easily fritter away his time. “There is only one true source of all knowledge, but the paths to attaining this knowledge are many. Only by following the right path to return to the ultimate truth can a man avoid losing his way. This story is found in a Daoist classic called Liezi (1). The expression歧路亡羊 (qí lù wáng yáng) from the story, literally “forked road, lost sheep,” later came to be used as an idiom. The idiom describes losing one’s way, going astray, or becoming hopelessly confused in a complex situation where there are too many possible paths or alternatives. The idiom is used to convey the idea that when confronted with many choices and complicated issues, one who seeks the truth is likely to become lost or to go astray unless one has determination and follows the right path. The book Liezi (列子, liè zĭ) is a major Daoist classic that consists of eight chapters, with most of the chapters being named after a famous figure in Chinese mythology or history from 2698 B.C. to 350 B.C.